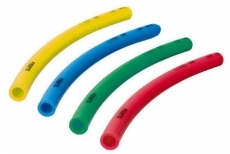 Polyurethan tubes are medium flexible and holds pressure up to 10 bar ≈ 145 psi. Good choice for connecting retracts in the model and the electronic-valves [0980, 0981, 0982]. The price listed is per Meter = 1 m.
This Product was added to our catalogue on Monday 10 January, 2011.